Test your Professional Knowledge of HR with this questionnaire to prepare for IBPS HR Officer Examination. 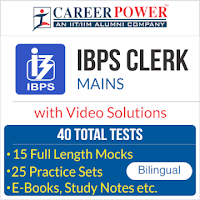 To score in IBPS SO (HR) Mains candidate must have adequate knowledge of Industrial Relations, Job Evaluation, Human Resource Planning, Labour Laws, Training and Development and more. This quiz covers important chapters of HR to help you prepare for the exam. Q.4. Which one statement is true about internal equity compensation system? (b) Internal equity doesn’t show the fairness of pay structure. (c) It means comparing employees with each other based on their individual characteristics. (d) Internal equity means placing employees on a job based on their skill set. (e) Internal equity means selecting the employees for training and development programme. Q.8. Which of the following term is said to be a part of Organizational Structure? Q.9. The occupier shall be punishable with imprisonment extending to _________months or fine ____or both for using a false certificate of fitness. Q.10. The employment of a young person on dangerous machines shall be prohibited the section -------- of Factories Act,1948.